Tonight the Kids'n'Cancer charity cyclists are in Melton Mowbray - having completed Day 2 and 160 miles of their Tower to Tower to Tower challenge. This morning the daring dozen were back on home soil for a brief time though, as they passed through Chesterfield (see video below) where they made good on their promise to donate funds to a local cancer sufferer. Jessica Howarth is just 9 years old and attends New Whittington Primary School. 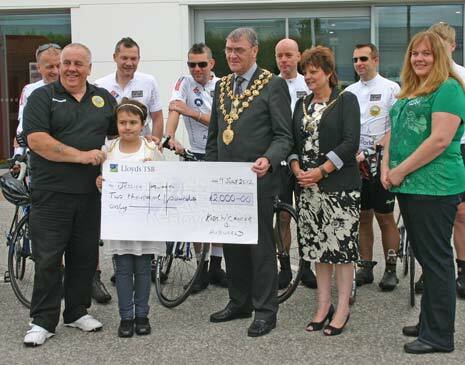 Today, with her parents beside her, Jessica was presented with a cheque by the Mayor and Mayoress of Chesterfield on behalf of Kids'n'Cancer (pictured below). Clearly still overwhelmed by the news and the generosity of the charity, Jessica and her mum Claire talked to us about just how Jessica has coped with a traumatic and distressing two year battle with cancer. A chatty and friendly little girl, Jessica is surrounded by a close knit and supportive family, who it's clear are proud of the way she's handled the diagnosis and the treatment which is ongoing. 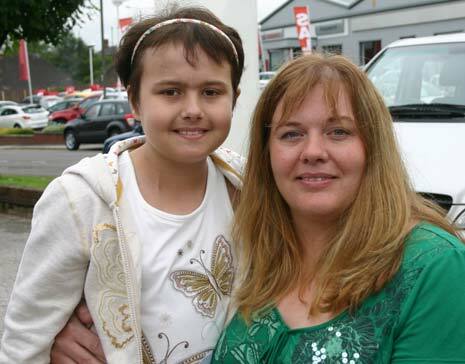 Mum Claire takes up the story, "Jessica was diagnosed in August 2010 with Acute Lymphoblastic Leukaemia, and she has remained in remission for 23 months. She finishes treatment in January but it has been a hard tough journey - but she looks marvellous today." The effects of the diagnosis, says Claire, were devastating, "It turned our life upside down when Jessica was diagnosed - it's like living on a knife's edge all the time - through the first year of intense treatment she missed a lot of school and she was prone to infections, some were quite serious but she managed to fight them off. She's one brave little girl - she gets me through it. "This money will help and Jess has plans for it! She wants her bedroom doing up to improve her life and with the rest of it, she would like to go to London and see a show, as a family. "It has had such an impact on the rest of the family. I have a younger son Ryan, and it's just been horrendous - but we live day to day - even now. She was only in hospital the other week through multiple infections, but she gets on with it and takes it in her stride - and that's remarkable." Claire was fulsome in her praise of the charity and others who have rallied round when they were needed, "The community as a whole has been fantastic, there's a fundraiser coming up and that's down to Donna Owen and she's brilliant. It's all word of mouth, and that's what led to today. I'm overwhelmed - it's lovely." Asked for her advice to parents who are also on the journey that the Howarth family have begun, an emotional Claire said, "My goodness, it is take every day as it comes, take deep breaths and hope for the best. Jessica's particular cancer is cyto-genetic, so she had to go on the highest regime of treatment - which is very toxic. "She finished the treatment in January and it's 5 months until her body gets rid of the toxins and we know whether her body has been suppressing the cancer, but we'll deal with that when it comes. It becomes normal, but absolutely no child deserves it and I wish Sophie (Roberts) all the best." Jessica herself said that, "The treatment is hard, and long, and sometimes painful." And Claire continued, "She still has blood counts every week, and that determines her level of infections and that determines where we can take Jess. She also has 3 monthly lumbar punctures and chemo in her spine. She's been remarkable but she enjoys school. 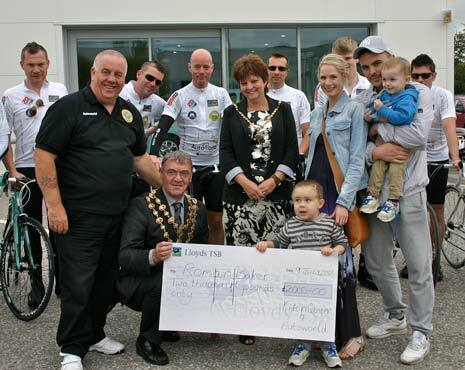 We're very proud of the boys who are cycling and raising money for children like Jess." On Saturday, the Baker family Sarah, Adam, Roman and Issaac (above) will begin the journey to Jacksonville in Florida where 3 year old Roman will begin Proton Therapy treatment for a brain tumour. A lively and chatty little boy who is at ease with everyone and charmed all at the event this morning, Roman has suffered since a young age and the treatment in the US represents what the family hope is his best chance of overcoming the illness and beginning to live a more normal life. Dad Adam told The Chesterfield Post about Roman's battle, "He started with eyesight problems as a baby and we took him to a doctor who referred him to opticians. After 6 months of saying he had healthy eyes, they referred us to the Queen's Medical Centre who told us he had a brain tumour and he's now had 3 operations. "They can't remove it, but it's like a cyst and it's pressing his brain. He's registered blind and has no sight in his right eye and very little in his left. He also has hormone problems, which are due to the pressure. The proton therapy should stop it growing and shrink it slightly." The effect on Roman has been, "Devastating, all the way through. It's affecting his school - we've had to have special things put in to help him. We have to watch him so much more closely and it's had a massive effect on his childhood." The trip to Jacksonville, says Adam, is a big deal for he family, "It's everything - a chance - it's so good we've been offered the chance, but it's 10 weeks in the US which is disruptive. Obviously, I won't get paid at work for those 10 weeks so this fundraising has been brilliant. "We got referred from the hospital for Proton Therapy - they thought it was his best chance and we feel very lucky - and we're lucky the NHS has funded it. 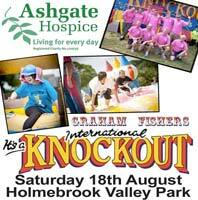 This fundraising will help us with expenses over there." Like any family, the Bakers are apprehensive about the trip, but are trying to keep things normal for Roman and his 18 month old brother, Issaac. Too young to comprehend the enormity of the trip, Roman is hoping for a chance to see his Heroes, Buzz Lightyear, Woody and Jessie whilst he's receiving treatment." 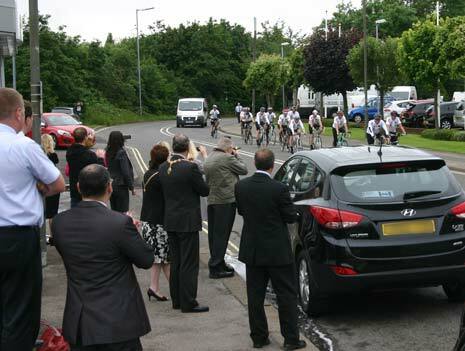 The Mayoress gets her chance to become a 'Tower Challenger' as she's given her own cycling helmet this morning! The Mayor of Chesterfield, Cllr Donald Parsons was emotional as he spoke to us after meeting and talking to the families, "I'm not far off tears - today is about kids and it's hard to see kids suffering. The two children and their families are remarkable in what they have overcome and it's wonderful that Kids n Cancer and Autoworld are doing this for the children. "I'm very proud. The charity has done Chesterfield proud and hopefully it will grow in order to help more children, though it's a shame that it is necessary and that children will suffer like this." 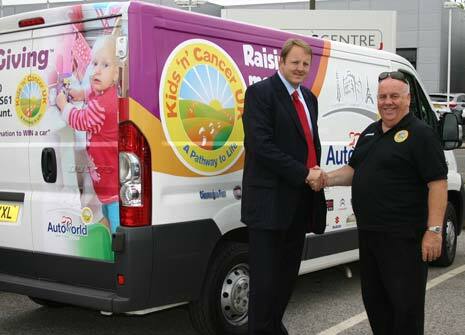 Chesterfield MP Toby Perkins was at Autoworld, Chesterfield to meet and pass on his support to the riders before they set off on the rest of the days 65 mile leg. Chesterfield MP Toby Perkins (above) was there to give his support to the team as they rested their legs and Olympian, Ellie Koyander joined in, along with her own Olympic Torch to show her support - and led the way for the riders (video below) to begin their short ride to the B2net for a quick photocall before resuming the rest of the day's ride. 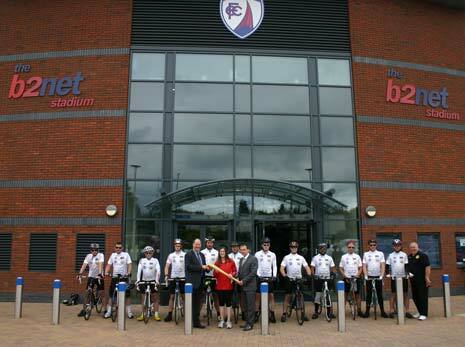 The riders line up at the B2net with Chesterfield FC Vice President, David Jones, Olympian Ellie Koyander and Chesterfield FC Director, Chris Breeze. For latest updates from the riders and their progress, CLICK HERE.